Prophet Muhammad never advocated war or bloodshed. He was a firm believer in peace and brotherhood. However, in the interest of self-defense and to protect the oppressed Muslims, he had to resort to armed campaings.The five major battles during the life of Prophet Muhammad were the battles of Badr, Uhud, Khandaq, Khyber and Hunayn. The Quraysh of Mecca feared that if all Arabs converted to Islam, it would mean to the Quraysh a loss of economic and political power and prestige that lead war between them and the Muslims. In the early days in Medina, the Muslims had to be vigilant every night to defend against the enemy raid. Abu Jahl's intentions were still murderous. He kept attacking any isolated parties of Muslims which could be ambushed, damaged crops and gardens. Reports were received in Medina that a Qurayshi caravan led by Abu Sufyan, the chief of Bani Ummayya, carrying merchandise and weapons was returning to Mecca from Syria after making an estimated profit of 50,000 dinars. These weapons and wealth were to be used to equip an army to fight against the Muslims. Muhammad decided to intercept this caravan and left the city for Badr, a village in the south-west of Medina, with a force of 313 men, of which 80 were Muhajirs, and 233 were the Ansars. In the meantime, the Meccan spies informed Abu Sufyan that a group of Muslims had left Medina, and was moving toward his caravan. So, he abandoned his usual caravan route, and moved westward to the Red Sea coast, and then turned south toward Mecca via an off-beat track. He also sent a messenger to Mecca asking for aid. Abu Jahl swiftly responded to Abu Sufyan's appeal, and led out of Mecca a force of 1000 warriors including a cavalry of 100 and 700 camels laden with battle supplies. 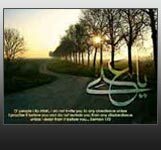 On reaching the neighborhood of Badr, Mohammed sent forward Ali, with a few others, to reconnoiter the rising ground above the springs. There they surprised three water-carriers of the enemy, as they were about to fill their sheepskins. One escaped and the other two were captured and taken to the Muslim army. From them Mohammed discovered the proximity of his enemy. This most vital intelligence was received through Ali ibn Abi Talib. His action, on the one hand, alerted the Muslims; and on the other, robbed the enemy of the advantage of surprise. The presence of an aggressive and shrewd enemy, instead of a caravan had changed the entire situation for the Muslims, and they had to make a fresh assessment of the situation The Muslims were poorly equipped, and had only two horses and 70 camels with them. Some of them had swords but no shields and others had shields but no swords. The Prophet who was aware of this and put the matter before his companions for consideration and decision. The first man who rose to speak was Miqdad, a Muhajir, and he said: "O Messenger of Allah, do what Allah has commanded you to do. We are with you, now and at all times; and we shall not tell you what the Israelites told Moses: ‘You and your Lord should go and fight against the enemy; as for us, we shall stay here, and sit here.' No, we shall not imitate the Israelites. We shall follow you and obey your orders." But Miqdad was a Muhajir, and Muhammad was anxious to know what the Ansar would do. Saad ibn Muadh, one of the leaders of the Ansar, rose and said: "We have borne witness that you are the Messenger of Allah. We have given you our pledge to obey you. Wherever you go, we shall go with you. If there is a showdown with the polytheists, we shall be steadfast in our support to you. In war and in peace, we shall be consistently faithful to you." Materially and numerically, the Muslims were at a disadvantage but they had faith in the inspired leadership of Muhammad and were united. Hubab ibn al-Mundhir, advised the Prophet to get in front of all except one, round which they should make a reservoir, so as to have a constant supply of water for the troops. The Prophet welcomed the suggestion and placed his force under Hubab's guidance. The battle of Badr was fought in the second year of Hijra, on the 17th of Ramadan, the ninth month of the Islamic calendar. The two armies ranged themselves in battle formation. The Prophet took a bow in his hand and walked between the lines dressing the rows of the Muslims. The battle began in the traditional Arab manner of warfare in which a champion of one side stepped out of his line, and challenged the heroes of the enemy to meet him in single combat. After these initial duels, the two armies attack each other, and engage in hand-to-hand fighting. The two brothers, Shaiba and Otba, and Walid, the son of Otba, advanced into the space between the armies, and defied three champions from the army of Mohammed to meet them singly. Mohammed turning to his kinsmen, said: "Ye, sons of Hashim! Arise and fight, according to your right." Then Hamza, Obeida, and Ali, the uncle and cousins of the Prophet, went forth. Hamza wore an ostrich feather in his breast, and a white plume distinguished the helmet of Ali. Then Otba called on his son, Walid, "Arise and fight." So Walid stepped forth and Ali came out against him. They were the youngest of the six. The combat was short; Walid fell mortally wounded by the sword of Ali. As soon as Walid was killed, the other warriors also charged at each other. Hamza killed Utbah. But Obaida was mortally wounded by Shaiba. When Ali saw Obaida collapsing, he attacked Shaiba, and killed him too. With their opponents dead, and no one in the field, Ali and Hamza carried Obaida back into the Muslim lines where he succumbed to his wounds. He was the first Muslim to be killed in the battle-field. Quraysh lost their three champions against the Muslims, and Abu Jahl, therefore, was not very eager to take further chances with Ali and Hamza, and he ordered his troops to advance. The Meccans charged the Muslims repeatedly but the Muslim line held firm under the command of Ali and Hamza. The Meccans were regrouping for a new attack when the Prophet signaled the Muslims to advance. Ali and Hamza led the counter-charge, and both of them carried hacked the thickest of the enemy ranks. Many of the Meccan leaders were killed, among them Abu Jahl himself. After his death, the idolaters began to flee and the Meccan retreat soon became a rout. Islam had won its first and the most important victory! The Quraysh casualties were extraordinarily high, and since most of them had occurred among the chiefs, the leadership at Mecca was permanently crippled. The hero responsible for this was Ali who alone killed 22 Meccans, twelve of them being the leading members of the clan of Banu Umayya. The rest of the army of Islam killed another 27 men. Among the spoils of the battle of Badr was a famous sword called Dhul-Fiqar, or the Piercer. Mohammed ever afterwards bore it when in battle, and his son-in-law, Ali, inherited it at his death. The battle of Badr is called the Furqaan in Muslim theology, because it was the first trial of strength by battle, in Islam, between the forces of Faith and Unbelief. The Muslims captured fifty prisoners of war and brought them before the Prophet who had to decide what to do with them. Umar advised him to kill them all, but Abu Bakr advised him to set them free for ransom. The Prophet accepted Abu Bakr's advice. Since there was no house of detention in Medina, the Prophet distributed the prisoners among the Muslim families who treated their prisoners as if they were their guests. The rich prisoners were released for a ransom. Those prisoners who could not pay a ransom but could read and write, were asked to teach the Muslim children, and when they did, they were also released. Those prisoners who were destitute, were released without any ransom. The Holy Qur'an rightly calls it the Day of Deliverance, the day before which the Muslims were weak, after which they were strong. Wealth, fame, honor, power, all of them were secured or at any rate brought within reach by the Day of Deliverance. The other outcome of the battle of Badr, however, was that Islam's victory kindled new and fiercer fires of hatred and hostility in the hearts of the Bani Umayya against Muhammad and Ali ibn Abu Talib and on the children of Muhammad.